McDonald's, Benefit Cosmetics and Dunkin' Donuts are among the pioneering brands creating clever live broadcasts using Facebook Live. From burger-themed art shows to wine-fueled makeup tutorials, brands are crafting clever real-time content using Facebook Live. While still in its infancy, the seven-month-old live video streaming service is proving to be a popular platform for brands looking for unique ways to engage consumers on social media. While some fast-food chains, like McDonald’s and Popeye’s, are using live video to commemorate brand-related "holidays," others, like Benefit Cosmetics, are broadcasting regular weekly content. Soon, advertisers will have an added option. Last week, Facebook said it is experimenting with mid-roll ads on live video. While some brands may jump at this new paid advertising opportunity, many are doing just fine without it. Here are the six most innovative brand uses of Facebook Live so far. 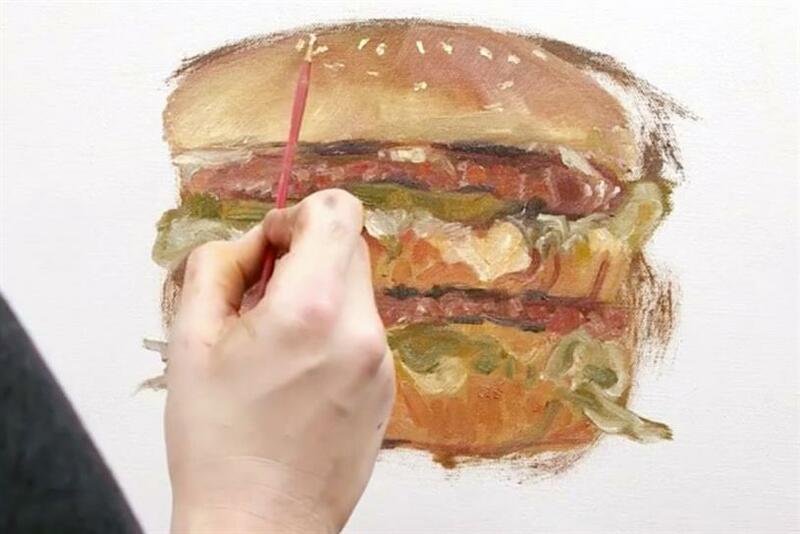 For its first Facebook Live video, McDonald’s hosted a burger-themed Bob Ross-styled art show on National Hamburger Day, a "religious holiday" for the brand, according to Paul Matson, McDonald's director of US social engagement. It produced one of the most entertaining brand uses of the live video feature to date. Working with Leo Burnett to create the hour-long broadcast, the fast food giant hired an improv comedian to play "Bevin Burger," who painted the Big Mac and Quarter Pounder, while waxing on about the "waterfall of cheese" and "impressive amount of beef." "Sometimes I think I need a chin bib because my mouth waters," he said, as the camera focused on the canvas. The paintings, created by artist Adam Holzrichter, were auctioned off on eBay, with 100% of the proceeds going to The Ronald McDonald House. Although initially nervous about using Facebook Live, the brand said that 80% of the feedback it received about the show was positive or neutral. Every Thursday, the LVMH-owned makeup brand uses Facebook Live to air a half hour segment called "Tipsy Tricks." Two hosts discuss beauty trends and give make-up tips while enjoying glasses of champagne and wine. Clearly, they know their audience, and the hosts answer viewer questions in the comments. It’s a laid-back approach to marketing its products to its customers, lovingly called "Benebabes" by the hosts. The videos average 25,000 views, but this one brought in 42,670, more than 600 impressions, 346 comments and 45 shares. Like McDonald’s, Dunkin’ Donuts took to Facebook Live to celebrate a brand-related holiday. In honor of National Donut Day, June 3, Dunkin' Donuts invited fans inside its "top secret" test kitchen to watch how cake donuts are made. Fortunately for viewers, the process only takes 12 minutes. A host described the technique, as the donuts sizzled in the fryer and a chef doused them in icing. Not only was the video entertaining, but it got the word out that all Dunkin’ Donuts locations were giving away free donuts with a drink purchase. The live video got 31,330 views, 2,450 impressions, 919 comments and 567 shares. It wasn’t the brand’s first go at livestreaming, however. On Valentine’s Day, Dunkin’ Donuts livestreamed a tour of its training facility and called the experience "Dunkin’ Brands University." Hill Holiday was the agency behind the campaign, which generated 38,253 views, 4,175 impressions, 517 shares and 1,400 comments. On National Fried Chicken Day, July 6, Popeyes, which has 670,000 Facebook followers, used live video to engage with fried chicken fans. Working with GSD&M, the brand created an event called the "Drive-Thru Bash." Actors and musicians hosted the online party on a set designed to look like a real Popeyes drive-thru, answering trivia questions and playing games like "Wheel of Chicken" and Charades. The event included two broadcasts that were strategically timed during lunch, so that viewers who played the games could win free boxes of the chain’s new five-dollar boneless chicken wings. The brand partnered with delivery service Postmates to deliver the food within 60 minutes of the interaction and gave away more than 18,000 boxes of free chicken. The brand's goal was to create "a more personal experience" and "connect with fans in real-time," Tom Hamling, group creative director at GSD&M, told Campaign US, before the broadcast. Combined, the sessions generated 54,291 views, 3,100 impressions and 449 shares. GE, an official sponsor of the 2016 Olympics, is behind the technology and lights at the entire event. Ahead of the event, GE used Facebook Live to show how the company was powering the games. But instead of turning to humans to show off the tech, GE used drones. The brand dedicated an entire week of video broadcasts to drones, attaching the hashtag #Droneweek to videos showcasing their technology. The 18-minute videos included bird’s eye views of the Olympic stadium and interviews with technicians, and the brand answered viewer questions in the comments section. The first video kicking off "Drone Week" on June 1 featured a drone light show, with five devices choreographed to techno music flying above Rio. It also included an interview with Ken Schweer, the CFO of Digital Energy at GE Energy, where he explained how GE uses drones for advanced inspections of pipelines and railway tracks around the world. As part of Airbnb's "Live There" campaign, the brand partnered with Disney for the April premiere of "The Jungle Book" in Los Angeles. Airbnb created a treehouse for the occasion and conducted interviews on the red carpet with stars of the movie like Mowgli. The first interview, however, belonged to Johnathan Mildenhall, Airbnb's CMO, who talked about how Airbnb has 4,000 tree houses available to vacationers around the world. The post received 112,435 views, 1,700 impressions, 259 shares 1,619 comments.